The Asset Browser displays all project assets in a source folder and file view to enable quick access and interaction. You can use the Asset Browser with other editor components to improve your development workflow, such as the viewport and the Entity Inspector. The Asset Browser shows all files inside your watch folders that are specified in the lumberyard_version\dev\AssetProcessorPlatformConfig.ini file. In the Asset Browser, usable files appear white. Non-usable files such as .exe or .zip appear gray. From Lumberyard Editor, choose Tools, Asset Browser. Dock the Asset Browser window in Lumberyard Editor as needed. The Asset Browser displays source assets along with their products. For example, an .fbx file appears with its meshes and animations. However, if the source and product asset have the same name and extension, then the products are hidden to save space. The WombearActor.fbx file has two products, an actor and mesh. 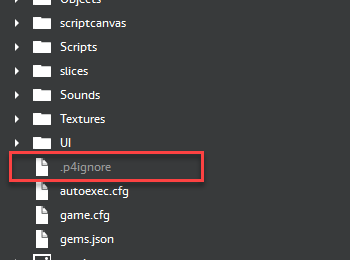 Files that are unprocessed or not usable in Lumberyard Editor appear gray. You can drag assets from the Asset Browser into the viewport or the Entity Inspector. Creates a new entity at the cursor's location. Adds the associated component, which is indicated by the icon next to the asset in the Asset Browser. Assigns the asset for that component's property. You can drag the brokenrobot05.cgf file to the viewport, which creates a new entity, adds a Mesh component, and assigns the asset into the Mesh asset property in the Entity Inspector. You can select multiple entities in the Entity Outliner and then select and drag an asset into the Entity Inspector. This adds the Mesh component and the associated mesh asset to the selected entities. You can also drag the appropriate file type into a component property's field. You can drag an asset file (.cfg) into the Material asset field on the Mesh component. The boulder in the viewport displays the new asset. Open with associated application – Opens the file with the default application that you specify. For example, if you specified Photoshop to open .tiff files, this opens the file in Photoshop. Open in Explorer – Opens the asset in Windows Explorer. Copy Name To Clipboard – Copies the asset name. Copy Path To Clipboard – Copies the path of the asset. 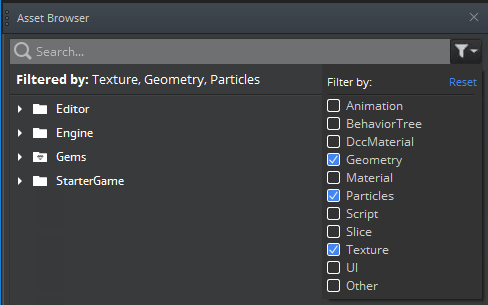 Edit Texture Settings – Opens the asset in the Texture Settings Editor. For more information, see Texture Settings Editor. You can also open some files in their respective Lumberyard tool, such as the Lua Editor for .lua files. Some files, such as .fbx files, have an additional Edit Settings option, which opens the FBX Settings tool. For more information, see Working with the FBX Settings Tool. Set Dynamic Slice – Create a runtime version of a slice. For more information, see Working with Dynamic Slices. Unset Dynamic Slice – Remove a dynamic slice. Open in Slice Relationship View – Show the dependencies and dependent members of the slice in a hierarchical view. 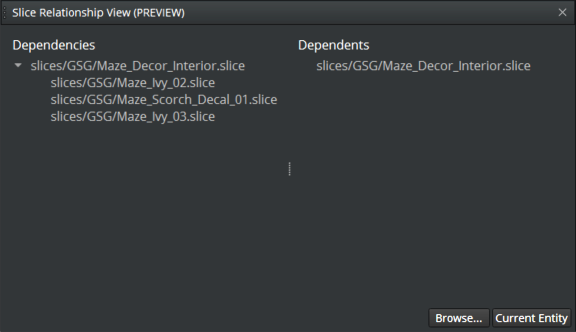 The following image shows the Slice Relationship View for the Maze_Decor_Interior slice from the Starter Game. For more information, see Working with Slices. Check Out – Check out the file in source control. Undo Check Out – Undo check out for the file. Get Latest Version – Get the latest version of the file. Add To Source Control – Add the file to source control. 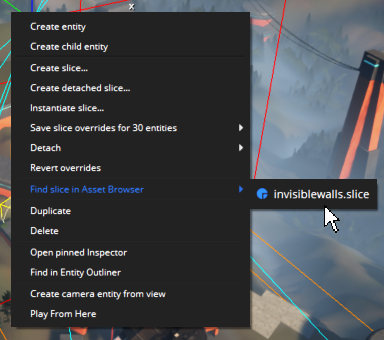 In the viewport, right-click the slice or slice entity and choose Find slice in Asset Browser. The Asset Browser navigates to the corresponding slice. You can filter what appears in the Asset Browser by file name, asset type, or both. In the Asset Browser, choose the filter icon in the upper right. Select one or more asset types. To filter by file name, type search terms into the search bar. The filtering process is dynamic, which means that search results update as you type. To reset your selection, in the Filter by drop-down menu, click Reset or Clear. Recognizes multiple words and performs an and search on assets and directories that contain all of the search terms in any order. Displays product assets that match the search string. Displays source assets that match the search string and contain at least one valid product. Displays directories that match the search string and contain at least one valid product. All products in each displayed directory and its subdirectories are displayed.